Throughout my life, I have never been an athletic or even a very active person. Until I was in my mid-twenties, I was naturally thin and never really thought much about it. When I began gaining weight, I still didn't really think much about it. In about 10 years time my weight almost doubled. Other than a short time in which a friend literally dragged me to the gym every day and stood over me while I worked out I never did anything about it. I didn't like the weight and knew it was un-healthy but I didn't have the self-discipline to stick with eating healthy or exercising, so I resolved myself to being about a 180 pound size 16...which is a lot on someone who is only 5' tall. Then I discovered Zumba. I don't want to sound like those crazy infomercials but this really has changed my life. A friend texted me one Monday afternoon in late 2009 and for some reason I said I would go to Zumba with her. I was back at the Y at 8:15 the following morning for Pilates and another round of Zumba. For the next year I was at the Y so much several people thought I worked there. I heard someone say that everyone has a 'soulmate' workout and Zumba is that for me. It just feels like dancing. And I saw results so quickly that it kept me motivated. To me-- Zumba is not just a workout. It was my gateway to a healthier lifestyle, to a healthier me. 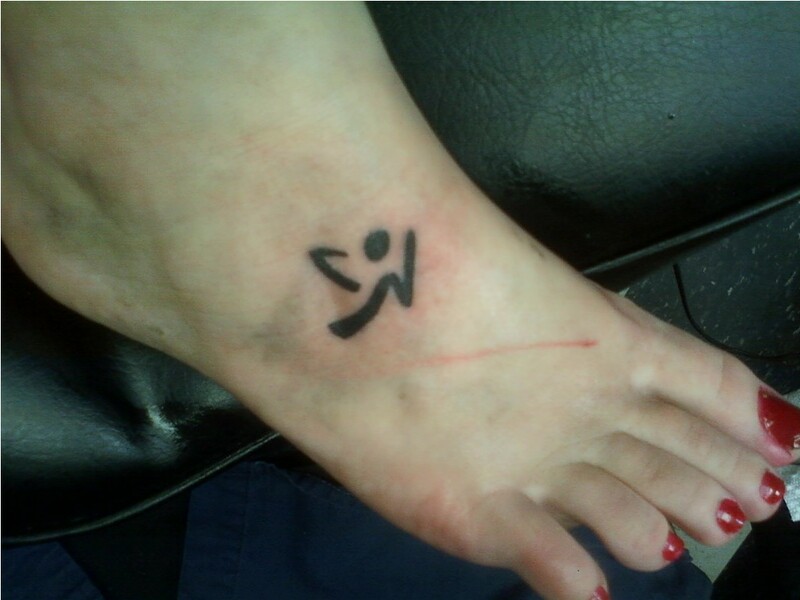 I wanted a tattoo of the Zumba symbol because anytime I think about giving up, I can look at that and know that there is something that I can do to keep myself on track, to keep myself healthy and in shape. This will always be there, reminding me of how much I've already accomplished and to not give up on myself. But here it is reminding me to always, in everything I do, put my best foot forward... preferably while doing a cumbia step. I love it!! I think your reasons were great & the tattoo looks awesome :D Happy Birthday Angela!!! I've never been 'inked' but if I did, it would need to be something of a very personal meaning. You found it and the location of the best foot forward, that's just AWESOME!!! Good for you! !